A unique collection of Fire Brigade memorabilia from across the globe is being sold by Sworders Fine Art Auctioneers on Tuesday 24 June 2014. The remarkable collection was put together by George and Pamela Hallam who were both long serving fire officers. They started with the Nottinghamshire fire service;George Hallam serving for 25 years from 1959 and Pamela for 17 years, having joined in 1968. More than two hundred artefacts from around the world are being sold, ranging from rare helmets, badges and uniforms, to fire marks, nozzles and medals, and date from the second half of the 19th century and through the 20th century. 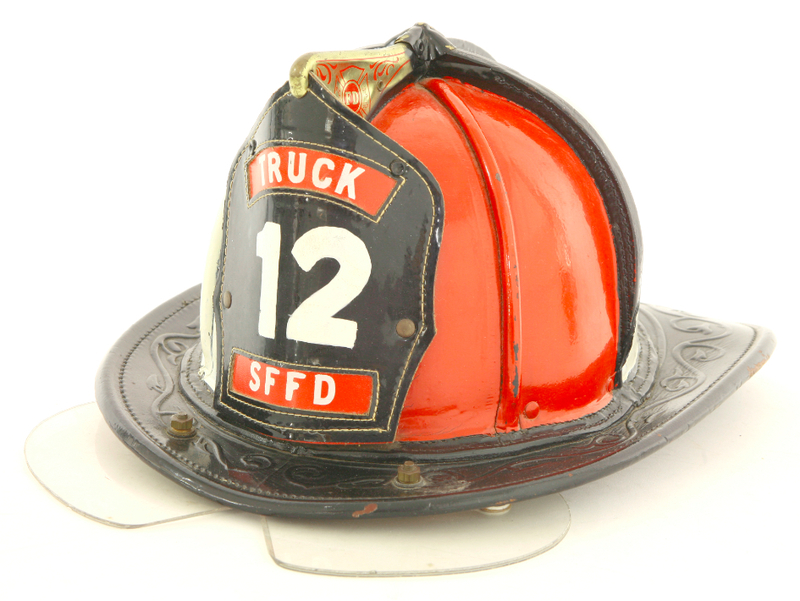 Iconic pieces such a San Francisco Fire Department helmet is starting with a price of £80, and bidding is expected to start at £150 on a scarce World War 2 NFS tin fire helmet. There are a number of medals being auctioned as well as fire badges put up on buildings in the 19th century to indicate if a property was insured. Most of the medals are for long service, with a good selection of British examples, nearly all named. They include a rare gold medal awarded to a Superintendent Webber in 1924. The Hallams travelled the world, adding to their collection while going from Australia to China, the Middle East, South America and the US among many countries. A series of handwritten notes record their visits to these countries and the history of the items they brought back for their collection. Sworder’s Marketing Executive, George Schooling, said, “This is an amazing collection as it is such a complete record of firefighting history, from so many places around the world. The couple clearly valued their days in the fire service and assembled this with such knowledge and passion.” Another highlight of the sale next week is a fire tender being sold by a local farmer who bought it for his own enjoyment. The Land Rover was just one of 47 built by the Rover factory and after being rolled off the production line was used in Ireland. The tender only has 11,600 miles on the clock and qualifies for free road tax in the UK. It’s expected to sell for between £15,000 and £20,000. The Hallam Fire Brigade Collection Sale takes place at Sworder’s auction rooms in Stansted Mountfitchet on Tuesday 24 June 2014.